Spinning babies- how does it work? – AskSalome! Spinning babies- how does it work? Over 35 years with birth including 20 years as a homebirth midwife, Gail now consults and goes out on midnight runs to long labors or breech births to help the determined parents served by her midwifery and medical colleagues. Back in the day, Gail was kept busy organizing doula program development in hospitals and community non-profits in Minneapolis/St. Paul while training doulas with DONA International approval status. Spinning Babies, Belly Mapping, Resolving Shoulder Dystocia and now Breech Basics are the unique offerings from Gail Tully. 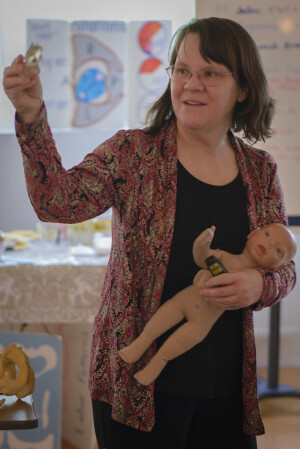 Gail Tully created the Spinning Babies® Three Principles to guide birth preparation and choose techniques to prioritize body balancing before the typical strategies of getting up and moving in labor. We teach physiological release rather than the rather mechanical assumption that birth is a passenger powering through the pelvis (The old 3Ps paradigm). The reason we are replacing the 3 Ps The release of the baby can be as natural as the release of hormones. Self-care and specific body work restores the balance and makes room for the baby. Then baby can put themselves into the best position possible for childbirth. Spinning Babies sees past both extremes in childbirth today. Neither the interventions of force or mistakenly giving more time in cases where the baby is actually stuck have offered truly empowering solutions. This approach gives a comprehensive plan for pregnancy preparation and labor activities to ease birth. They can be used with any childbirth method or none at all. Spinning Babies approach is good in any childbirth setting, home, hospital and independent birth center. My belief is that the maternal positioning of Optimal Foetal Positioning® works more spontaneously when we have balance in the pelvis (including ligaments, fascia and muscles with the pelvis). In a long or painful labor, or when baby seems not to fit, we must be smart about finding which level of the pelvis the baby’s leading part (head or bottom) is waiting or pressing upon. By noting fetal position and/or the station of fetal descent, a system of protocols (series of activities) can be matched to help mother and baby. So, first, we balance and then we pick maternal positions to Address the muscles and other “soft” tissues and match the technique to open the diameter of pelvic level (pelvic station) where baby’s head is staying in a non-progressing labor. Fetal position shares a stage with several leading actors, such as Flexion, Body Balance, and, don’t forget the importance of the Parasympathetics in the ease of birth. Modern lifestyles need more than maternal positioning to aid fetal positioning. Body balancing is necessary and so is a unique paradigm to put Balance before Force in the minds of care providers and parents alike.